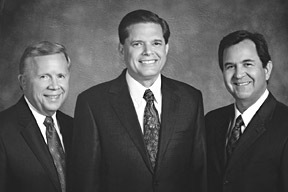 Above: David L. Beck (center), president; Larry M. Gibson (left), first counselor; and Adrián Ochoa (right), second counselor. Have you ever been worried about measuring up to a task? Imagine how Joshua might have felt as successor to the great prophet Moses. The heavy responsibility to lead the people of Israel into the promised land fell to Joshua. Remember that the promised land was occupied by numerous Canaanite nations, many of which were fearsome and warlike. Can you imagine that Joshua may have felt unsure of his abilities to accomplish such a daunting task, maybe even afraid? In the space of four verses in the first chapter of Joshua, the Lord commands Joshua to be strong and courageous﻿—three times! (see verses 6–9). Then the Lord promises Joshua that he will succeed in bringing the Israelites to their land of inheritance, that strength and courage will come to him because of his obedience to all the law, and﻿—most significantly﻿—that the Lord will be with him wherever he goes. The 2010 Mutual theme is the third instance of the Lord’s call to Joshua to “be strong and of a good courage” (Joshua 1:9). That same call to courage is yours. And the same promises are yours as well. With the Savior’s help, you too will succeed in your callings and in your life. You will have strength to withstand any temptation as you obey the commandments and keep the standards found in For the Strength of Youth. As you honor the priesthood and each week renew the covenants you made at baptism, you can have the Savior’s Spirit with you﻿—always. There were many unknowns facing Joshua. He didn’t know how he would be able to bring the children of Israel into the promised land, but he trusted in the Lord. You face challenges in your life. You might be one of the few members of the Church in your school or even in your family. You might feel isolated or discouraged or afraid. You might feel uncertain about your future in these troubled times. But be of good courage. The Lord is with you. You can trust in Him. He will help you succeed. This wonderful reminder is found in Proverbs 3:5: “Trust in the Lord with all thine heart; and lean not unto thine own understanding.” As we serve in our calling, we are committed to trust in the Lord. We encourage you to do the same. We love you. We trust you. You are part of a select generation of strong and courageous young men.